Sarcastic Quilter: Favorite Things Friday - Quilt Shows! 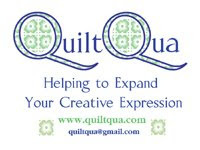 Anyway, I was able to attend the Hampton quilt show and today, I'm meeting Ms. Susan at Quixotic Crafter over at the Dulles quilt show. As a matter of fact, I need to attach photos fast and get going or I'll be late even though she's got the worse drive! So, I'll leave you with some Hampton eye candy. Pics are small but I believe they will enlarge if you click on them. Love the eye candy...have fun without me!! Have a fun time, Becky! You have a beautiful day to enjoy - weather and the sights! I've never been to a quilt show. Hope you have a wonderful time today! Where is today's quilt show? Dulles? is that near the airport? I dont go to enough quilt shows. It's something I'd like to share with people but none of my RL friends quilt. That Aspen quilt is my favourite - it's so pretty! Have fun at the quilt show...I hope you took lots of pictures to share. If hubs keels over I'll fly on over and join you for the summer in that RV of yours. Yes you're practical - I have a contingency plan too around Mr. P's passing - just in case. Perhaps we're both morbid. What beautiful quilts. I love all the appliqued ones. Shame hubby doesn't like an RV. Me and Mine are buying a campervan at years end and next year we are off for 6 weeks....and country patchwork shops and shows are on the agenda. Great FTF. Thank you for sharing the eye candy. Quilt shows are such fun (they can also be expensive if you hang out with the vendors). they are amazing quilts, hope you had a great time, i like your backup plan, you got him life insurance right? !